We’ve posted photos of some of the birthday cakes we make for our family, but we’ve never really mentioned what type of cake we make, so it’s high time we remedy that situation. Our favorite cake flavor is chocolate, and we’ve been using a recipe from Hershey’s for a sour cream chocolate cake that is moist and flavorful. The recipe makes about 6 cups of batter. 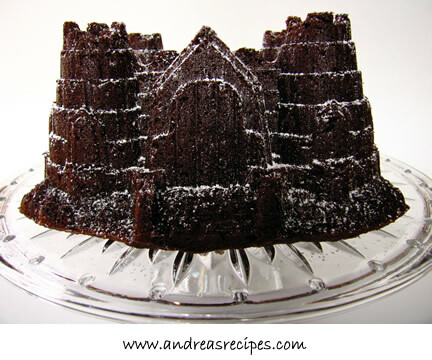 For this post, the boys and I made the cake in a new Bundt pan the shape of a castle, which I found at Chefs Catalog a few weeks ago when they had a free shipping promotion. The cake pan was on sale for about 1/3 the price of retail, so we decided to add it to our collection. 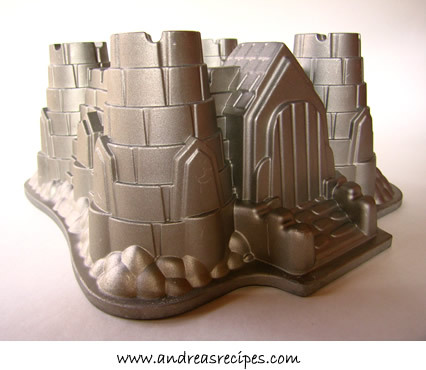 The boys were very excited about making a castle cake and could barely keep their fingers out of the batter or the finished cake before I could catch a few photos (notice how some of the turrets are a bit mangled on top from little fingers pinching pieces). The castle pan holds 10 cups of batter, and the risen cake went right to the top edge of the pan and spilled over a bit in the middle, so I recommend putting a piece of foil on the rack below the cake pan to catch any drips. I was very pleased at how nicely the details showed up on the finished cake, and a sprinkling of powdered sugar looked like snow on the castle. The boys loved it! For the above pans, grease and line with wax paper or parchment, then grease and flour the paper. Adjust cooking times accordingly. 1. Preheat oven to 350°F/175° C.
2. Prepare the boiling water, then mix the cocoa with the water in a small bowl. Stir the mixture until smooth, then set aside to cool. 2. In the bowl of the stand mixer, beat the butter and sugar in until fluffy. Add each egg one at a time and beat well after each egg. Stir in the vanilla, then add the cocoa mixture, stirring well. 3. In the medium bowl, stir together flour, baking soda and salt. In a liquid measuring cup, stir together the milk and sour cream. Pour about 1/3 the dry ingredients in the mixing bowl, then about 1/3 of the milk and sour cream mixture. Beat well. Continue until all of the ingredients are incorporated. Pour the batter into the prepared pan. 4. Bake 45 to 50 minutes or until wooden pick inserted in center comes out clean. Cool in the pan for 10 minutes, then remove the cake from the pan and cool completely on a wire rack. Dust with powdered sugar and serve. Looks very regal! We took bought the castle bundt pan on sale at chefs. I busted it out last weekend with a sour cream chocolate chip coffee cake. The kids loved it. And they thought it hilarious that the sugar on top resembled snow. What a great deal that pan was. This is magestic! I’ve looked at these pans, and wondered if the cake would really come out of the pan okay. This looks fantastic, and I love the snow covered towers! You are so talented! Your other cakes are just gorgeous as well. I don’t think I had seen them before. Love the pans too. such an elegant and magical cake! I love the simplicity of it. I made this recipe yesterday. I was a bit dissappointed with the result. In no way am I criticising your recipe but you may be able to see where I can improve next time. I found the cake, which I baked in a 9x13in tin, to be not very light and quite dense. I must also say that I had to convert the recipe to grams because our cup measurements are different to yours..the bain of my life!!!! I found that the amount of sugar was quite a lot to the amount of butter. I may not have creamed it long enough. Also I felt that the cocoa mixture was very thick even, though it mixed in okay to the batter. I will re-do my conversions and see if I get a better result. When you say dense, are you saying it did not rise? I would characterize the cake as rich and moist, not light and fluffy… is that what you mean by dense? ?